Hello Darlings, I've seen her strut the runways of Toronto Fashion Week as Eva Shaw and entertain the crowds with her amazing mixes at The Hoxton as DJ Bambi! From becoming the face of Canadian popular brand Moon Apparel to the covers of worldwide glossies — Eva Shaw is not just a pretty face she is also a very talented and well-respected DJ! Marta: What inspired you to become a DJ? 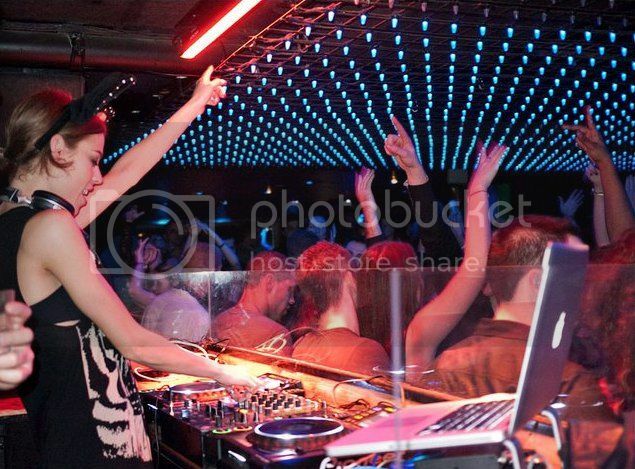 Eva: I started DJing about 4 or 5 years ago in Canada as a hobby. I never really thought I would be a DJ. I was modelling and taking theatre courses in Toronto. I caught on to it pretty quickly and started playing at local venues. I always loved electro house and heavy bass but it wasn't as mainstream a few years ago as it has become now. Marta: How did your move to New York influence you as a DJ? Eva: I moved to New York two years ago to model and sort of dropped djing for a little while. I didn't think it was a real career and I also wasn't familiar with new york at all and was pretty nervous about the whole idea of it. A friend of mine who knew a few club owners really pushed me to get back into it. After about 6 months I started playing at some smaller spots and gradually got noticed more and more. Marta: What's your next step in music? Eva: Right now my next level is production. I bought a studio for my apartment here and am teaching myself everything I can. It's a completely different talent from djing... and I'm fascinated by it.. What gets me really excited is seeing people so happy and having fun and the fact that I can provide that for them is the best feeling in the world. Marta: What are the differences of playing in New York vs. Toronto vs. Vegas? Eva: It's definitely interesting to see how different cities are from one another in terms of crowds and how people react. I love Las Vegas because people are there to have a good time. In Toronto, the crowds are younger and a bit more hipster which is really fun. I usually experiment there a little bit and throw in some dirty, harder beats. New York is definitely the toughest place to DJ. Every club in New York is different. You have a lot of models and celebrities at spots like Lavo and Provocateur. People who go out often and have seen every DJ on the planet. Eva: I don't buy a ton of beauty products, as I like to keep it simple. But I love L'oreal Double Extend Mascara! It's so cool, it just rolls off instead of smearing. Marta: What's your best kept beauty secret? Eva: I really believe that it's more what you put into your body than what you put on it. Makeup and products can only do so much. Drink water, sleep, and eat properly! I'm also a huge believer in being happy and passionate about your life. When you're doing what you love and being a good and giving person, you feel better — and when you feel better, you are more attractive! Eva: I love the LF store ... I don't really shop at one place. I love mixing old beat up tomboyish items with designers like Chanel. I always loved BCBG ... really beautiful stuff. Stella McCartney is always a favourite as well. Eva: It's pretty fun to walk around Paris and browse through the amazing vintage stores. There are some really cool boutiques by rue Richelieu that have tons of neat old designer things. I don't shop too often but it's nice when you can take a coffee/wine break in the spring in Paris! Marta: Favorite pair of shoes? Eva: I'm pretty diverse in my shoe choices... I go from beat up combat boots to huge stilettos. My biggest shoes obsession might be those Balenciaga thigh high boots... they cover your entire leg almost. I'm also a big fan of loafer/slip on flats with the spikes all over by Louboutin. To follow Eva, check out DJ Bambi on Facebook and Twitter!